Apple might be preparing for 3D next, as they have recently filed a new patent which hints working with new ‘Killer’ 3D camera and an application enabling users to create video game-style avatars. These reports were first spotted by Patently Apple website. The website also reported that the new camera technology is developed in the Apple Labs and most probably a part of the next generation of the Apple devices. 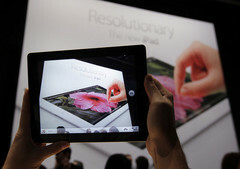 The 3D imaging camera is also expected to apply to both, still images as well as videos on iOS devices. This camera will be using the depth detection sensors such as LIDAR, RADAR and Laser to create stereo disparity maps in 3D images. They also seem to be using some advanced technologies like the advanced chrominance and luminance Sensors for superior accuracy in the colors and even gesture recognition. The site also mentioned that the technology covered in the patent filing will also provide iOS devices with the ability to view killer 3D images that could only be appreciated with the Apples High resolution Retina displays.